Ottawa, ON, December 15, 2016 – The Canadian Real Estate Association (CREA) has updated its forecast for home sales activity via the Multiple Listing Service® (MLS®) Systems of Canadian real estate Boards and Associations in 2016 and 2017. 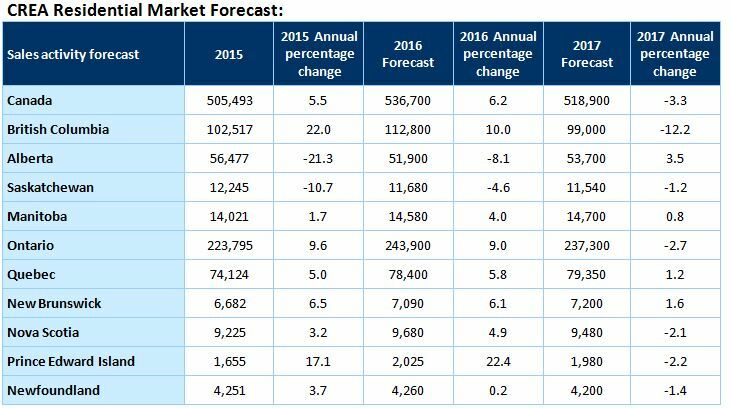 Canadian housing market trends have evolved largely as expected since CREA last published its forecast in September. Sales activity in British Columbia is showing signs of returning to, and stabilizing at, more normal levels, while Ontario sales continue to set new records despite an unprecedented supply shortage in the Greater Toronto Area (GTA) and throughout the surrounding region (Greater Golden Horseshoe). Mortgage regulations were further tightened following CREA’s previous forecast. In the near term, tightened regulations are expected to reduce the number of first-time buyers who qualify for mortgage financing, particularly in pricier markets where there is a severe shortage of lower-priced listings. Tightened mortgage regulations and lending guidelines are also expected to increase capital costs for lenders, resulting in modest increases in mortgage interest rates in the New Year. These regulatory headwinds were not a factor at the time of CREA’s previous forecast, and have resulted in downward revisions to the forecast for sales and average price in 2017. Nationally, sales activity is projected to rise by 6.2% to 536,700 units in 2016. This represents a slight upward revision from CREA’s previously forecast increase of 6.0%. However, the forecast for sales activity was revised upward for Ontario and downward for British Columbia. Projected annual sales for 2016 would represent a new annual record for national activity, up 3.3% from the previous record set in 2007. 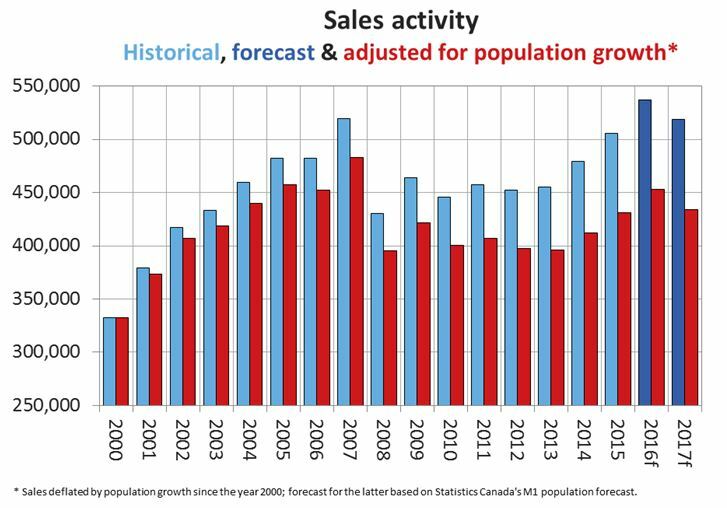 That said, after adjusting for population growth, sales are nonetheless expected to remain below the 2007 peak. Among Canada’s most populous provinces, British Columbia is still forecast to post the largest annual increase in activity (+10.0%) due to unprecedented strength in sales there early this year. Ontario’s annual increase in sales (9%) is anticipated to be nearly as large. Prince Edward Island should post the largest annual percentage increase in sales this year (+22.4 percent), making it one of only four provinces to set a new annual sales record in 2016 (along with British Columbia, Manitoba and Ontario). Among provinces where housing market prospects are closely tied to the outlook for natural resource prices, Alberta is still expected to record the largest annual decline in activity in 2016 (-8.1 percent), followed by Saskatchewan (‑4.6%). Meanwhile, annual activity in Newfoundland and Labrador is now anticipated to register almost no change in 2016 as compared to 2015. Elsewhere, sales are forecast to rise in Manitoba (+4.0%), Quebec (+5.8%), New Brunswick (+6.1%) and Nova Scotia (+4.9%). In the latter three provinces, activity has been slowly but steadily gaining momentum, and 2016 is expected to mark a multi-year high for annual sales. Year-over-year average price gains have continued to accelerate in Ontario amid strong demand in the face of an unprecedented supply shortage. Meanwhile, average prices in British Columbia have receded due to a sharp decline in multi-million-dollar single detached home sales in the Lower Mainland. As a result, the projected annual average price for Ontario in 2016 has again been upwardly revised compared to CREA’s previous forecast, while the projected annual average price for British Columbia has again been downwardly revised. As with the revisions to forecast sales, revisions to average price forecasts for these provinces mostly offset each other at the national level. In provinces where economic and housing market prospects are closely tied to the outlook for the oil patch and other natural resource industries, average prices appear to be stabilizing in Alberta and Saskatchewan but remain down from year-ago levels in Newfoundland and Labrador. Average prices in other provinces are either rising modestly or holding steady, reflecting well balanced supply and demand for housing stock. The national average price is now projected to rise by 10.5% to $489,500 in 2016, with a slightly smaller gain in British Columbia ($688,300; 8.1%) and a larger gain in Ontario ($535,700; 15.1%). Elsewhere, average prices are forecast to rise by 2.4% in Manitoba, 2.5% in Quebec and 1.9% in New Brunswick. Annual average prices in Alberta, Saskatchewan and Nova Scotia are projected to remain largely stable. By comparison, the forecast average price increase (11.6%) for Prince Edward Island has been revised upward to reflect an exceptionally strong price gain recorded in the third quarter. 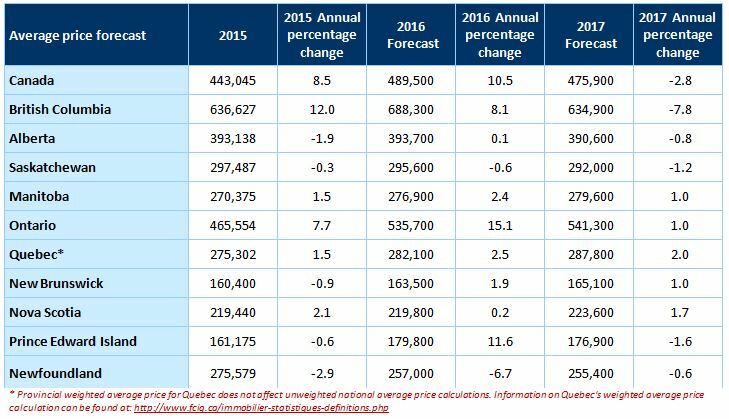 By contrast, average price in Newfoundland and Labrador is now forecast to ease by -6.7%. In 2017, national sales are forecast to number 518,900 units, representing a decline of 3.3% compared to projected activity this year. Transactions in B.C. and Ontario are anticipated to remain strong but fall short of this year’s record levels due to deteriorating affordability, an ongoing shortage of affordably priced listings for single family homes and tightened mortgage regulations. British Columbia home sales are forecast to decline by 12.2%, while annual sales in Ontario are forecast to retreat by 2.7%. Sales are also forecast to ease slightly in 2017 in Saskatchewan (-1.2%), Nova Scotia (-2.1%), Prince Edward Island (‑2.2%) and Newfoundland and Labrador (-1.4%). The downward revision to forecast sales in Prince Edward Island reflects unexpected strength in sales this year that is not expected to reoccur in 2017. Nonetheless, sales for the province are expected to remain strong, as its economy should continue benefiting from a weakened Canada-U.S. currency exchange rate. Sales in 2017 are forecast to rise by 3.5% in Alberta and by 1.2% in Quebec. The forecast rise in Alberta’s sales in 2017 mostly reflects slow sales activity in the first quarter of 2016, a repeat of which is not expected. Sales are also forecast to improve modestly in Manitoba (+0.8%) and New Brunswick (+1.6%). The national average price is forecast to decline by 2.8% to $475,900 next year, with modest price gains near or below inflation in Manitoba, Ontario, Quebec, New Brunswick and Nova Scotia, together with small declines of a similar magnitude in Alberta, Saskatchewan, Prince Edward Island and Newfoundland and Labrador. While the average sale price in British Columbia is expected to decline by 7.8% in 2017, this largely reflects an anticipated decline in single family home sales activity at the higher end of the market – particularly in the Lower Mainland. The forecast dip in the national average price in 2017 along with a decline in British Columbia is expected to be similar to the trend in 2012, when a more normal year for activity in Greater Vancouver followed record level sales activity for multi-million dollar homes in 2011. As such, the forecast decline reflects the influence exerted by the composition of sales activity on average price (as it did in 2012 versus 2011). Meanwhile, an ample supply of listings relative to demand is anticipated to keep price gains in check in other provinces, although sales have begun to draw down inventories in provinces where supply had been elevated in recent years.